Coffee's popularity has exploded in recent years, and there are now more coffee shops around the world than ever before. That said, forking out for a shop-bought cup of coffee each day can get pricey, and sometimes you just don’t want to step out of the house. For days when you need that caffeine fix but don’t want to venture out or hand over some of your hard-earned cash, you could benefit from having a coffee machine in the comfort of your home. Here, we’ll look at the Keurig k15 review, which is a low-budget machine capable of making single-serve coffees from a pod. Who is the Keurig K15 for? What's Included with Keurig K15? The Keurig K15 is a compact and highly portable coffee machine that uses the modern and popular pod-based design to produce single-serve cups of coffee within a few minutes. 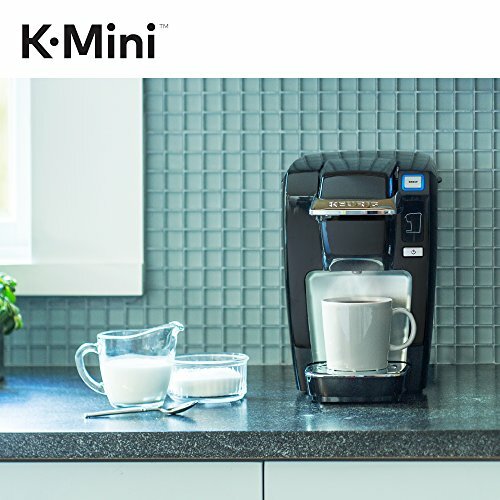 As a member of the Keurig family, this coffee maker can use a vast array of 500 different brands and varieties of coffee pods, being compatible with all 'K-Cup' pods. These pods are manufactured by the same company responsible for creating the Keurig range, so you needn’t have any concerns around compatibility problems. If kitchen space is limited, then the K15 could be an ideal choice; it’ll tuck neatly into a corner, without domineering too much of your countertop real estate. What’s more, at dimensions of just 6.9 x 10.7 x 10.8, you have a machine that can conveniently be taken into the office, or placed there as a permanent fixture, without taking up too much desk space. The product itself is a relatively new entry onto the coffee maker scene, having been available through mainstream websites like Amazon since late-2017. The K15 single-handedly widens the options available to anyone wanting to buy a Keurig machine, as other machines in the range are mostly similar in size, whereas the K15 is vastly more compact. It’s thanks to advances in technology and the popularity of pod-based coffee makers that this machine manages to have such a low price tag. This machine probably isn’t the best choice for the on-the-go coffee drinker who likes to take a travel mug on every journey. The limited dispenser space means that some larger travel-sized mugs can’t fit under the spout, so filling up a flask for a long journey isn’t going to be easy. As a result, this machine is more suited to people looking to make a single early morning caffeine hit to go with breakfast. Larger families with numerous coffee lovers or those who like to entertain large groups might also want to look for a machine that incorporates a water reservoir, as the machine’s single-cup capacity requires water to be loaded on an as-required basis. However, this does make the K-15 perfect for single tenants or homeowners, as the absence of a water container means that limescale is less likely to build up within the machine as quickly as it would in a machine that has a reservoir full of standing water. What's Included with the Keurig K15? The Keurig K15 mostly comes with the basics you'd expect to get started. For example, you'll get the unit itself, a power cord and the built-in water reservoir. You'll also get a user manual, which is handy for understanding how functions such as the descaling process work. However, where this machine is lacking is in the provision of coffee pods. There are no Keurig pods included as part of the package, nor do you get any descaling solution, though as we'll explain below, there are some household hacks that can save you money on not purchasing this solution yourself. Still, you'll need to stock up on coffee pods in advance if you expect to use this machine the same day that it arrives. So, we’ve covered the kind of person or people who would benefit most from this product, but now we’ll look more in depth at the range of features and other characteristics that make up this coffee machine. If you’re looking for something that’s sleek and stylish, but that won’t take up a great deal of space, then this could be the machine for you. Despite the comparatively low price tag and small stature, the machine still has access to a vast range of hot drinks. The only area in which the machine is lacking, and in which other machines may triumph, is in any additional features or functionality that go beyond the basic brew-making abilities. The K15 is compatible with any coffee pod from the Keurig coffee range, which doesn’t limit the range of drinks types or flavors available by any means. In total, the machine can support over 500 distinct brands and varieties of coffee pods produced by the Keurig company. These options include classic favorites, like Green Mountain Coffee, Lipton and Starbucks, as well as tea and hot chocolate drinks for the kids or sweet tooth in your life. The size of this machine makes it well-suited to office environments and other locations, not just within the home. A lack of moving parts such as the built-in single-cup reservoir also means that there are few detachable accessories, which keeps the machine both lightweight and compact. It’ll only command a very small footprint no matter where it’s set up. What’s more, there’s a cord storage feature that keeps the power cable hidden away and unobtrusive, so that you won't have wires running all over the place. Certain features of the K15 make it easy to clean up in the event of spills or accidents. The included drip tray is capable of holding a full brew using a Keurig coffee pod, in case you forget to place a mug beneath the dispenser before kicking off the process and walking away from the machine. The inclusion of a single-cup reservoir also means that you won’t need to empty out excess, unused water into the sink once you’re finished. The descaling process is also super simple and requires no additional cleaning pods or other accessories that are sold separately. Instead, you’ll simply need a descaling solution. In the absence of this, or if you’re looking to save money, you could even process vinegar through the machine as a cheap alternative to genuine descaling chemicals. Just be sure to run water through the machine several times afterwards, to avoid having the flavor of your coffee tainted. There's no denying that the Keurig K15 is at the cheaper end of the budget range when it comes to home coffee machines. For many cheaper models, you might expect more limited functionality, though the K15 actually features an automatic-shutoff function. When you've added a single cup of water and your cup of coffee has been brewed, this machine will automatically turn itself off after 90 seconds, which helps to preserve your home energy bills. When you get the Keurig K15, there's some first-time setup required before you start brewing your first cup of coffee. Dispose of all packaging and packing tape from the brewer and plug the device into a grounded socket, then power on the device for the first time. You'll note an LED flashing blue, which indicates a need to add water. Next, add a single 8 oz. cup of water into the water reservoir. Lift the handle on top of the device, which is the compartment in which you'd normally insert a pod. At this point, water will be fed from the reservoir into the brewer, and you can close the handle once this process has completed. You will not be drinking this water, so don’t worry about coffee pods at this point. Finally, once the 'BREW' button has begun flashing blue, press the button to begin the process. After a couple of minutes, the water will be dispensed, so be sure to have a cup on the drip tray. Dispose of the dispensed contents, and your machine is ready to use. The process of making a cup of coffee is as simple as repeating the above process, but adding a coffee pod when the handle is elevated. Take a look at this video, which highlights the sleek design of the K15, as well as some of the features that we’ve covered above, and how to brew your first cup. It's worth bearing in mind the routine maintenance that you'll need to carry out from time to time, as the build-up of calcium deposits and limescale can affect your coffee maker's performance. This is a something that you should do for every coffee machine, regardless of make or model, and even with other kitchen appliances, such as kettles. Generally speaking, you should descale the system every 3 to 6 months. Descaling the K15 is straightforward and requires no supplementary equipment, other than a descaling solution; Keurig manufacture and sell their own, but in reality, you can use a similar store-bought product. Simply add around 4-5 oz. of descaling solution to the water reservoir with around three-quarters of a cup of fresh water, and then place a large ceramic cup beneath the dispenser on the drip tray. Follow the normal process for making a cup of coffee, but add no coffee pods, and discard the liquid into the sink. Repeat the process twice over to ensure that the chemicals have fully cleared the system. To address one of the main disadvantages of the K15 Coffee Maker, we can look at one of its close siblings, the K55 Coffee Maker, which is also manufactured by Keurig. 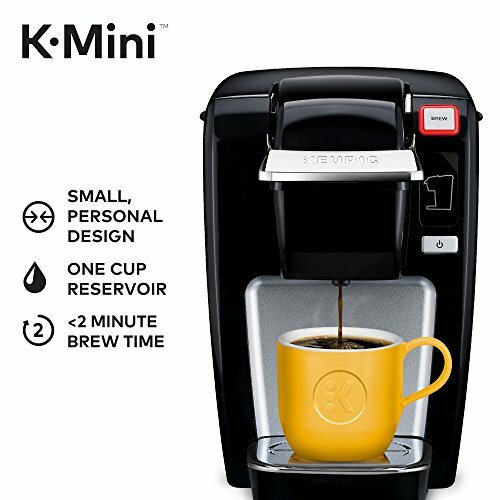 The K-Mini K15 does not feature a water reservoir; this means that you must refill the device with fresh water for each cup of coffee that you’d like to brew. On the other hand, the K55 features a removable 48oz water tank, meaning you can pump out more than one cup of joe at once. For couples or families that love coffee, the K15 might become a tad too tedious in this respect. The Keurig K-Select coffee maker is another strong alternative to the K15 unit. Though much of the functionality is similar, the key difference in the K-Select machine is that it features a taller space for mugs beneath the coffee dispenser area, meaning that larger cups can fit into the machine without having to remove the drip tray. To clarify, the K15 coffee maker can only support cups of around 6-8oz in size, unless the drip tray is first removed. That said, perhaps you're more interested in a family-friendly coffee maker that produces entire batches of brew for large groups, as opposed to single-serve pods. In this case, a strong alternative is the Aicok Coffee Maker. It's a lesser-known, foreign-made brand, but in spite of this the machine has overwhelmingly positive reception from users, and it's very inexpensive when compared to bigger brand names like Cuisinart, for example. Constantly buying coffees on the go can quickly get expensive; if you spend 5 bucks on a coffee every weekday morning for a year, you’d have spent around $1,300. Alternatively, for a fraction of the price, you could pick up the K15 coffee machine for the price of around 2 weeks’ worth of Starbucks. It doesn’t have the same kind of functionality as some of the more expensive, larger or bean-to-cup machines, though it’s all you’ll need to produce a range of over 500 drinks in the morning, quickly and cheaply. There are many coffee machines available as part of the Keurig range, and the K15 is the smallest of the bunch. However, if simplicity and cost are your two driving factors, and you’re not interested in having all the bells and whistles of a bigger, pricier machine, then this Keurig unit is an ideal choice.